What’s not to ‘LOVE’ about Robert Indiana? Robert Indiana was adopted as a baby and lived in 21 different homes by the time he graduated from high school. That’s a lot of places, so you’d think little Robert wouldn’t have had much of a chance to make an impression. But this kid defied all expectations! Even as early as elementary school, Indiana’s teachers were blown away by the primordial stirrings of his creative talent. In fact, Robert’s first grade teacher was one of the primary proponents in encouraging him to become an artist. After studying at the Art Institute of Chicago, the Skowhegan School of Sculpture and Painting in Maine, and the Edinburgh College of Art in Scotland (phew! ), Indiana moved to the Coenties Slip in Manhattan, formerly a major port but by that point a remote community of artists scraping a living among the abandoned warehouses. Very trendy. In New York, Indiana quickly became regarded as one of the most creative artists of his generation and set himself apart from the masses as leader of the Pop Art movement. Today, Indiana is best known for his iconic “LOVE” statue, which was later featured on a U.S. postage stamp. After the image became popularized, critics began to dismiss Indiana as a sell-out. But Indiana was not to be relegated to the realm of Andy Warhol-- he removed himself from the New York art world and relocated to a random island in Maine to pursue his artwork, unfettered by the weight of his newfound fame. His birthname was Robert Clark, but his "nom de brush" is Robert Indiana. Considered himself a sign painter. After all, he grew up around them. His father worked at Phillips 66. His mother ran a diner with the big "EAT" sign flashing overhead. When his father left, he drove away, down Route 66. Indiana’s favorite quote: "There have been many American SIGN painters, but there never were any American sign PAINTERS." Many of his paintings and sculpture incorporate numbers or short words like "Eat", "Die", and "Hug". Often with biting commentary about life in the U.S. Indiana’s critical social commentary did not stop the post office from issuing the famous “Love “ stamp in 1973. Possibly the most popular ever – 300 million. That’s a lot of love. Robert Indiana (born Robert Clark; September 13, 1928 – May 19, 2018) was an American artist associated with the pop art movement. 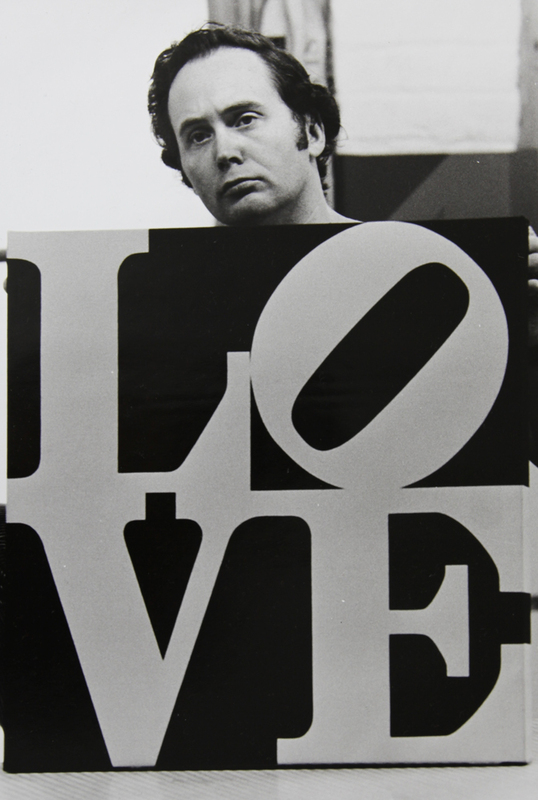 His "LOVE" print, first created for the Museum of Modern Art's Christmas card in 1965, was the basis for his 1970 Love sculpture and the widely distributed 1973 United States Postal Service "LOVE" stamp. He created works in media including paper (silk screen) and Cor-ten steel. Robert Indiana was born Robert Clark in New Castle, Indiana, as the only child of Earl Clark and Carmen Watters. After his parents divorced, he relocated to Indianapolis to live with his father so he could attend Arsenal Technical High School (1942–1946), from which he graduated as valedictorian of his class. After serving for three years in the United States Army Air Forces, Indiana studied at the Art Institute of Chicago (1949–1953), the Skowhegan School of Painting and Sculpture in Maine (summer 1953) and Edinburgh University and Edinburgh College of Art (1953–1954). He returned to the United States in 1954 and settled in New York City. In New York, Indiana's lover Ellsworth Kelly helped him find a loft on Coenties Slip. On Coenties Slip he met neighboring artists like Jack Youngerman, Agnes Martin and Cy Twombly, with whom he shared his studio for a time. In 1964, Indiana moved from Coenties Slip to a five-story building at Spring Street and the Bowery. In 1969, he began renting the upstairs of the mansarded Victorian-style Odd Fellows Hall named "The Star of Hope" in the island town of Vinalhaven, Maine, as a seasonal studio from the photographer Eliot Elisofon. Half a century earlier, Marsden Hartley had made his escape to the same island. When Elisofon died in 1973, Indiana bought the lodge for $10,000 from his estate. He moved in full-time when he lost his lease on the Bowery in 1978. Indiana grew reclusive in his final years. He died on May 19, 2018, at his home in Vinalhaven, Maine, of respiratory failure at the age of 89. One day before his death, a lawsuit was filed over claims that his caretaker had isolated him from family and friends, and was marketing unauthorized reproductions of his works. Check out the full Wikipedia article about Robert Indiana.